As he runs as fast as he can, he meets other monsters of the night who want to eat him: Dracula, ghosts, and werewolves. But the list does not end there; trick-or-treaters in costume, a policeman, and a dog all begin to chase the tasty, flaky, spiced deliciousness that is the Pumpkin Pie Man! Until . . . look out! The Pumpkin Pie Man crashes into the side of a purple minivan, flies high into the air, and lands in the mouth of one lucky dog named Coco. Playful and silly, this Halloween version of The Gingerbread Man is sure to leave you smiling and hungry! The text inspires youngsters to read with animated language and sound effects, while the illustrations bring this dessert creation to life! 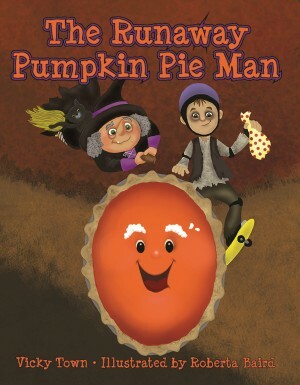 Playful and fun, the images will have you chasing this runaway Pumpkin Pie Man through the book’s pages. Author and storyteller Vicky Town has been performing for more than twenty-five years at schools, libraries, museums, colleges, festivals, conferences, retirement centers, and art centers. She belongs to the Imagine That! Storytelling Guild in Mt. Airy, North Carolina, and the National Storytelling Network in Jonesboro, Tennessee. She and her husband own Haven Farm in Fancy Gap, Virginia, where they grow vegetables for food banks and host Stories Under the Stars nights. Roberta Baird is a freelance illustrator and artist specializing in children’s book illustration, murals, and set design. Her artwork has appeared in educational textbooks, picture books, and magazines. A member of the Society of Children’s Books Writers and Illustrators, she resides in Houston, Texas, with her husband and four children. I love the language in this book! I am impressed not only with the use of great descriptors, but the vernacular of teenagers; this funny story will appeal to all levels. This book is a treat! !